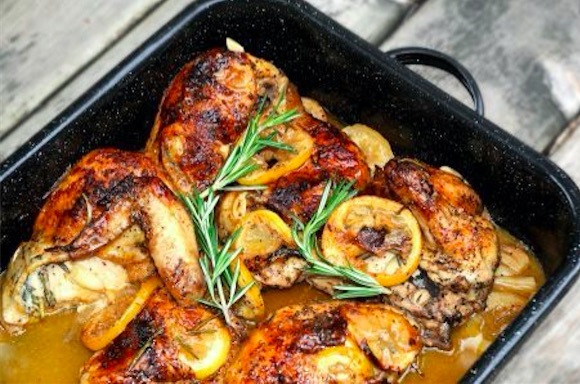 The fragrant skillet-braised chicken called kotopoulo me dendrolivano (Rosemary Chicken) is a mainstay in the repertoire of home cooks all over Greece. To me, this is Greek home cooking at its best: maximum flavor extracted from a handful of simple ingredients. Oregano is the herb typically used, but the substitution of rosemary here only underlines the easygoing adaptability that gives the dish its wide appeal. First, whole chicken legs are dredged in flour and nestled in a skillet to brown in olive oil. Then a few sprigs of fresh rosemary and a couple of bay leaves go into the skillet along with a glassful of white wine, followed, a few minutes later, by a cup or two of water. And then there’s nothing left to do but cover the skillet and leave the chicken to cook until it’s fall-off-the-bone tender and infused with the fragrance of the herbs. The sauce in the bottom of the pan more or less makes itself; a generous squeeze of lemon juice at the end is all it needs to really sing. In the northern city of Thessaloniki it is served with a fluffy rice pilaf; in another part of Greece, it might come to the table with a side of mashed or fried potatoes. But with a dish this accommodating, you can’t go too wrong serving it with whatever you happen to have in your pantry or your refrigerator on a given evening. As it is for wines, there are plenty of great ideas to combine it with. Try a refreshing white Moschofilero or a soft red Agiorgitiko.